The Italian phrase bel canto can be translated as "beautiful song" or "beautiful singing." To vocal-music buffs it refers to a style in which the top priority is the sheer beauty and elegance of the singers sound. By extension, bel canto describes Italian opera of the early 19th century, when Bellini, Donizetti, and Rossini turned out countless works brimming with florid melodies and long, legato lines that demanded singers whose vocal agility and tonal purity could touch the heart. These days, audiophiles also associate the term with Bel Canto Design, a Minnesota-based high-end company whose distinctive products exemplify the virtues of bel canto via innovative electronics aimed at sounding as liquid and alluring as the great singers of the distant past. And the "Design" part of the companys name lets you know that the look of their products sets them apart from the standard black-and/or-silver boxes festooned with the buttons, bells, and whistles typical of audio gear. Founder and chief designer John Stronczers designation of the CD2 and DAC3 as members of his e.One line indicates that they occupy the top echelon of his current product roster. Both models share the same look -- sleek, simple, functional. Placed side by side, they look like a single long, svelte component, their diminutive sizes belying their rock-solid build and big sound. The first thing I noticed about the e.One CD2 player was the unusual way it houses -- or, rather, unhouses -- the disc its playing. The CD2 is a top-feeder, but without the traditional sliding or top-lifting door. Instead, the naked disc spins in plain view, protected only by an aluminum bar that permits enough room for the user to gingerly place the disc on a center cone. Once settled, the disc is secured with a supplied magnetic puck, which damps vibrations as the CD spins. Bel Cantos User Guide suggests that, when the CD2s not in use, you can leave a disc in position to protect the exposed laser lens from unwanted dust. Though I noticed no ill effects from dust, Im wary of such designs over the long term, especially for users who have cats who like to explore intriguing new surfaces. The CD2 tips the scales at 18 pounds, with dimensions of 8.5"W x 4.5"H x 12.5"D; the DAC3 is 8.5"W x 3"H x 12.5"D and weighs 14 pounds. The front panel of the CD2 is minimalism exemplified: set into its silver face is an oblong display window, and on its right, a single, large control wheel. Depending on how the CD2 is used -- as a standalone CD player direct to the amps, or as a CD transport feeding a D/A converter or preamp -- this control lets you choose inputs, change sample rates, and adjust volume. The CD2s wide range of operating choices will entrance the dedicated tweaker, while its minimalist approach to front-end labeling and controls may seem challenging to others. The manual covers the available choices and tells you how to access them, but theres an adjustment period for those used to components that have a discrete button for each function. On the rear panel is a Fixed/Variable Output button; set to IN, its in Fixed mode and routes the signal to your preamp; OUT means its in Variable mode and sending the signal from the CD2 to the amplifier. Analog outputs include single-ended RCA and balanced XLR; digital outputs are AES/EBU XLR, S/PDIF BNC, and TosLink. All connections output 24-bit/96kHz signals; the CD2 will play "Red Book" CDs, CD-Rs, and CD-RWs. 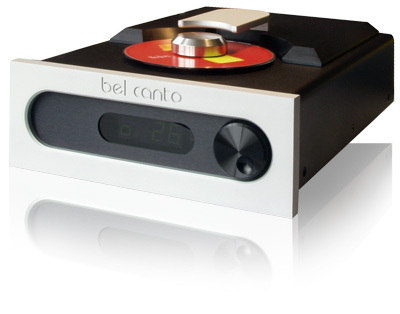 The CD2 has a four-layer PC board, multistage power supplies, 24/192 upsampling (available when using its analog outputs only), and more, but Bel Cantos trademarked Ultra-Clock architecture is cited in their literature as a prime factor in the players sound. They claim that Ultra-Clock has extremely high accuracy and "jitter performance 50x better than other clocks," something I hope no one asks me to confirm. I found the CD2s outboard power supply intriguing -- its a cell-phone-sized box attached to a power cord that plugs into a receptacle on the rear panel. The AC cord then runs from the power-supply box to the outlet. 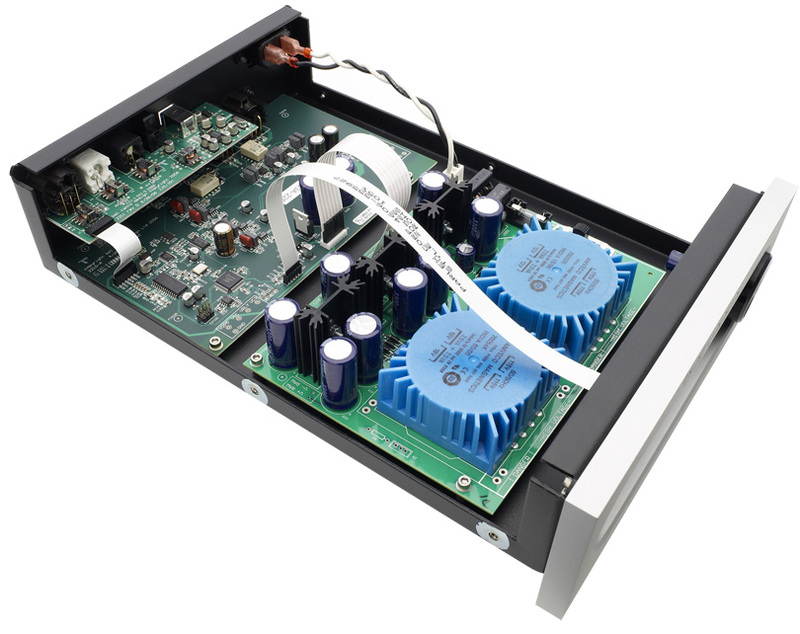 This isolates it from the CD mechanism and internal circuitry, doing the job of a conventional separate-box power supply. This neat, space-saving PS is also said to contain filters and regulators that lower noise levels. The DAC3 shares many features of the CD2 -- it looks like the players twin, and the DAC3s rear panel closely mimics the players layout, including a Fixed/Variable Output button that allows it, too, to be used with a preamp or fed directly to an amplifier. Theres also a USB input that enables playback from a computer using a recent operating system. Other inputs include XLR AES/EBU and S/PDIF, all galvanically isolated from internal circuits to lower noise. All digital signals are upsampled to 24/192 via a two-channel Burr-Brown PCM 1792 DAC chip that gets its datastream from the CS8421 Cirrus sample-rate converter chip. Like the CD2, the DAC3 includes the Ultra-Clock circuit. The DAC3s sole front-panel knob makes accessible a variety of functions: standby and operating modes, input selection, soft mute, and volume control are mentioned in the Users Guide, but I suspect it can be trained to cook dinner and clean windows as well. Like the CD2, the DAC3 may take some getting used to -- Im still navigating with manual in hand. Theres an inherent conflict between simplicity of visual design and complexity of operation. Bel Canto leans toward a more elegant appearance; other manufacturers prefer more user-friendly arrays of multiple and clearly marked buttons and switches. I inserted the Bel Cantos in my reference system, alongside the Cary 306 SACD Pro player, the Reimyo CAT-777 line-stage preamplifier, modified Jadis JA-80 monoblock power amplifiers, Von Schweikert VR-4 Gen.III HSE speakers, and a compatible mix of wires that included Nordost Quattro Fil interconnects and Siltech G3 AC cords, interconnects, and speaker cables. My listening room is about 21D x 18W by 8.5"H, with the speakers about 8 apart and 3.5 from the front (shorter) wall. My listening position varied; much of the time I sat in an easy chair about 9 from the speakers, but sometimes moved forward for nearfield listening, and sometime back against the bookcase-lined rear wall, where the sound, against all expectations, was as coherent and realistic as a front mezzanine seat in Carnegie Hall. Most of my listening was with the Bel Cantos tethered to the outstanding Reimyo preamp. For a relatively small part of it, toward the end, I bypassed the Reimyo and passed the DAC3s signal directly to the Jadis monoblocks. In the past, Ive been disappointed when I heard a CD player or DAC direct into my systems amp(s). Each time, Id been led to believe Id hear greater transparency and detail, but the results never came close to such expectations. So I was dubious that the Bel Canto duo would match or exceed what I heard when they were played through my preamp. In fact, they didnt match the quality obtained through the Reimyo, but they came far closer than I ever thought they would. In the next section Ill mention some of the results of my listening, results that were representative of the sound I heard with a variety of other discs beyond the ones mentioned in this review. My comments refer to the Bel Cantos played through the preamp, but Ill briefly mention findings from the discs heard when the DAC3 signal was fed direct to the amps, since they, too, were consistent with what I heard with other CDs. I usually begin the serious, note-taking phase of a review with my torture test: a few CDs Ive found that give me a quick read of whether the component(s) in question threaten to do serious damage to my ears. I also want to know how the gear copes with recordings Ive found especially revealing in one or more aspects, most especially those relating to my own listening priorities. For example, elevated mid-treble reproduction drives me up the wall, so I usually start with a solo violin and/or soprano voice. A friend once claimed that he can tell everything he needs to know about a piece of equipment by listening to the first few minutes of Rachmaninoffs Symphony No.2. The work begins with deep rumblings in the bass, followed by a wind choir, then a sighing melodic figure in the strings thats then elaborated on by the brass, the violins climbing higher and higher, and rhythmic plucking in the cellos. Heard via a well-recorded performance by the Rotterdam Philharmonic under the baton of Edo De Waart (Pentatone 51861530), this sequence, with its wide dynamic and tonal ranges, told me a lot about the Bel Cantos stellar performance. But my friends formula makes for imperfect snap judgments best suited to traversing such events as the annual Consumer Electronics Show -- it cant substitute for listening to a range of program material over an extended period. So I turned next to Viktoria Mullovas superb new set of J.S. Bachs Sonatas and Partitas for solo violin (CD, Onyx 4040). Id recently heard this on my reference Cary 306 SACD Pro, and it was fresh in my memory, especially as Mullova plays Bach on a period violin with gut strings and a baroque bow. While many period instrumentalists make sounds akin to chalk on a blackboard, Mullova plays with a velvety bottom range and a sweet treble. The Bel Cantos captured her performances well, but my reference player put more body on her tone, coming closer to the sound of a real violin. With the Bel Cantos, the violin seemed a half-size too small, its timbre a shade too thin -- not anorexic, but on just the slimmer side of reality. Since tonal body is very high in my hierarchy of audio preferences, that was a disappointment, though hardly a fatal one; many audiophiles actually prefer an aural image with the tautness and edge that lent excitement to the way the Bel Cantos projected Mullovas sound. I think were back in "Cool vs. Warm" territory, a battlefield Id prefer not to re-enter. Suffice it to say that the recording sounded good on both; if I ultimately preferred the sound of the Cary, others might prefer the sound of the Bel Cantos. Later, listening to Mullovas Bach through the DAC3s signal fed directly to the amplifiers and bypassing my preamp, I was impressed by the immediacy of the sound and appreciated her uniquely warm lower register, but disappointed in the upper trebles lack of bite. The Bel Cantos excelled with a terrific new recording of Handel opera arias and duets sung by soprano Sandrine Piau and contralto Sara Mingardo, with the Concerto Italiano led by Rinaldo Alessandrini (CD, Na�ve 30483). Piaus bright, pure soprano was well reproduced, and the contrasting, intertwined voices of the soloists were thrilling to hear. The engineers give full due to the period orchestra, reproduced on a deep soundstage that lends the illusion of reality to the recorder players at the rear of the stage. The Bel Cantos also caught the resonance of Cambridges Trinity College chapel, the recording venue of the school choirs performance of Handels Chandos Anthems, led by Stephen Layton (CD, Hyperion CDA67737). Here, the choirs big, full sound and the natural balance between soloists and orchestra were big pluses, as was the transparency of the recording, which lent clarity to each section of the chorus. Unfortunately, that transparency meant that the flaws of individual singers were exposed, poor diction and heavily aspirated bass runs detracting from the performance. A couple of orchestral recordings confirmed the Bel Cantos excellence in capturing wide-ranging dynamics and realistic soundstaging. Demonstrating those attributes was a fine recording of Haydns symphonies 25, 42, and 65, with Patrick Gallois conducting the Sinfonia Finlandia (CD, Naxos 8.570761), especially as Gallois split the first and second violins to left and right, respectively, liberating the high-strings sound from the left speaker and adding a special dimension that clarified the string lines. Though most Haydn symphonies lack an extreme dynamic range, this recording accurately conveyed the gradations of mezzo-forte wherein most of the music resides; even casual listening revealed that the horns were well back toward the rear of the stage. Larger tonal and dynamic palettes are found in Dvor�ks bigger works, especially when recorded with the accuracy of Yakov Kreizbergs performance with the Netherlands Philharmonic (SACD/CD, Pentatone 5186082). The tremendous dynamic range and orchestral detail of his Symphony No.7, plus the sound of the strings -- sweet where it has to be, biting where a touch of edginess is appropriate -- made this a joy to listen to. The discs companion work is Dvor�ks The Golden Spinning Wheel, a tone poem based on a grisly folk tale featuring a wicked stepmother, the dismemberment of the kings chosen bride, her resurrection, and the feeding of her killer to the wolves. Somehow Dvor�k managed to bring some of his loveliest music to a plot line that seems more appropriate to screaming brass and batteries of percussion. The Bel Cantos were up to letting me in on the glories of Pentatones excellent sound, even from the CD layer of this hybrid SACD. The enormous dynamic range was impressive, as were the abundant orchestral detail and the deep, wide soundstage, but most impressive to me was the way the solo violins harmonics were captured with accuracy in a passage about 20 minutes into the work, just after a dense wind chorale. This was another disc that suffered somewhat when played direct from the DAC3 to the amplifiers, most noticeably in the somewhat mushy bass line. Finally, I turned to a pair of jazz classics wonderfully recorded for Blue Note by the legendary Rudy Van Gelder, and reissued in superb SACD transfers by Analogue Productions. Of necessity, since the Bel Cantos dont do SACD, I listened to the upsampled CD layers of the hybrid discs and reveled in the immediacy of the sound. John Coltranes classic Blue Train album (Analogue Productions CBNJ 81577 SA) never sounded better in my experience, his big, burly tenor-sax timbre caught perfectly, as were Lee Morgans pungent trumpet and Curtis Fullers wide-timbre trombone. Philly Joe Jones drums came through loud and clear, as did his delicate brushwork behind Paul Chambers bass solo. But the irrepressible Coltranes intro and solo in "Moments Notice" had an effect of shock and awe: soaring, with a creamy upper register and playing that brimmed with passionate involvement. Similar electricity was found on Lee Morgans Leeway (Analogue Productions CBNJ 84034 SA). As on Blue Train, here is an abundance of white-hot post-bop playing that was a joy to hear in such vivid, open sound. It would be easy to isolate such moments as alto-sax master Jackie McLeans slashing intensity or Morgans trenchant trumpet, but listening for what the Bel Cantos were doing to penetrate deep into a brilliant recording-transfer job, I found subtler pleasures. One was the sheer brilliance of Morgans playing, amplified by sound that captured perfectly placed slurs and the equally perfect articulation of his explosions of rapid-fire notes. Another was the way Bobby Timmons piano was reproduced, his vamping on "Midtown Blues" affording special pleasure. The Bel Canto e.One CD2 and e.One DAC3 are clearly superior components: sleek in design, impressive in sound, and versatile in use. At a combined list price of $5490 theyre by no means cheap, but Ive heard far more expensive single-box and separate models that cant measure up to their performance. I suppose that qualifies the Bel Cantos as a good choice of source component in todays market, especially since they can be worked into a system piecemeal: the CD2 as a standalone player, albeit one of marginal pretensions; then the DAC3 joining it and played directly into the amplifier, saving on the cost of a preamp and associated cables; and finally -- best by far of all -- in combination with a top-grade preamplifier between DAC3 and amplifier. While I felt that my reference Cary 306 SACD Pro was ultimately more satisfying, with a firmer bass, sweeter high end, somewhat greater liquidity, and more body to voices and instruments, the combination of CD2 and DAC3 was a neutral-sounding alternative with special strengths in soundstaging and detail retrieval -- and its $2500 cheaper. 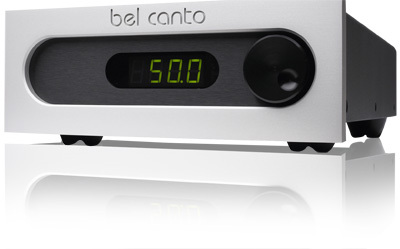 The Bel Canto e.Ones also made my short list of gear that encourages further listening. The pleasure of my extended listening sessions with them was characterized by a desire to hear "just one more CD," regardless of the hour. That, to me, distinguishes the best from the rest.